Horncastle Town Council has in place a Snow Plan which aims to clear snow and ice from priority areas in the town (see the plan below for details). The work is carried out by the Estates Supervisor and local volunteers. If you are interested in volunteering please contact the Town Clerk on 01507 522957 or via email using the form on the Contact us page. When icy weather is forecast these bins will be available for local people to use to clear roads and pavements in their area. 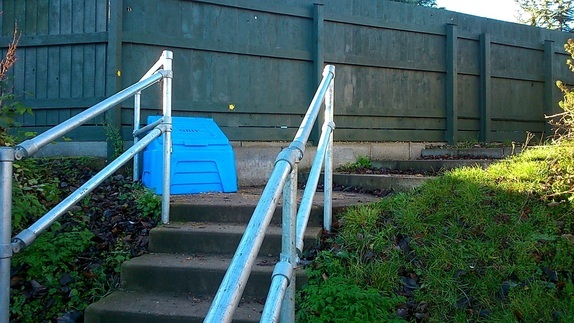 Grit from these bins must not be used to clear private drives and paths though. Unfortunately all the scoops from the grit bins have now been stolen! The Town Council will not be replacing them but if you do regularly take grit from your local bin to grit your area then we can issue you with a scoop to store at home. Email the council with your details and we will arrange to drop one round to you. EAST Lindsey District Council has once again published the Government’s snow and ice advice to remind local people that they can clear pavements and public spaces themselves, providing it’s done sensibly. Prevent slips – Pay extra attention to clear snow and ice from steps and steep pathways – you might need to use more salt on these areas. If you clear snow and ice yourself, be careful – don’t make the pathways more dangerous by causing them to refreeze. But don’t be put off clearing paths because you’re afraid someone will get injured. Remember, people walking on snow and ice have responsibility to be careful themselves. Clear the snow or ice early in the day – It’s easier to move fresh, loose snow rather than hard snow that has packed together from people walking on it. So if possible, start removing the snow and ice in the morning. If you remove the top layer of snow in the morning, any sunshine during the day will help melt any ice beneath. You can then cover the path with salt before nightfall to stop it refreezing overnight. Use salt or sand – not water – If you use water to melt the snow, it may refreeze and turn to black ice. You can prevent black ice by spreading some salt on the area you have cleared. You can use ordinary table or dishwasher salt – a tablespoon for each square metre you clear should work. If you don’t have enough salt, you can also use sand or ash. These won’t stop the path icing over as well as salt, but will provide good grip under foot. Offer to clear your neighbours’ paths – If your neighbour will have difficulty getting in and out of their home, offer to clear snow and ice around their property as well. Check that any elderly or disabled neighbours are alright in the cold weather. If you’re worried about them, contact your local council. Along with the Government’s advice, the District Council has also published a list of car parks it will try to keep clear during snow and ice. Council operated car parks – Tesco, Horncastle and Co-op, Louth are contractually required to be kept free from ice and snow by the supermarket operator. The Government’s snow and ice guide can be viewed at www.e-lindsey.gov.uk/snowandice or a copy can be picked up from your local customer service centre or leisure centre.